Look at the pictures and then read the two narratives....... WOW!!! We were the overhead tanker, one third of the way through cruise, making circles in the sky. The first few minutes of the hop were busy. As we approached mid-cycle, that most boring time in a tanker hop, we kept ourselves occupied with fuel checks. We were keeping a close eye on one drop tank that had quit transferring with about 1,000 pounds of fuel still inside. I had tried going to override on the tank pressurization, but that didn't seem to work. My BN (Bombardier/Navigator) and I discussed the problem. We decided it was probably a stuck float valve. Perhaps some positive and negative G would fix it. We were at 8,000 feet, seven miles abeam the ship, heading aft. I clicked the altitude hold off and added some power to give us a little more G. At 230 knots I pulled the stick back and got the plane five degrees nose up. Then I pushed the stick forward. I got about half a negative G, just enough to float me in the seat. I heard a sharp bang and felt the cockpit instantly depressurize. The roar of the wind followed. I ducked instinctively and looked up at the canopy expecting it to be partly open. Something was wrong. Instead of seeing a two or three inch gap, the canopy bow was flush with the front of the windscreen. My eyes tracked down to the canopy switch. It was up. My scan continued right. Instead of meeting my BN's questioning glance, I saw a pair of legs at my eye level. The right side of the canopy was shattered. I followed the legs up and saw the rest of my BN's body out in the wind blast. I watched as his head snapped down and then back up, and his helmet and oxygen mask disappeared. They didn't fly off; they just disappeared. My mind went into fast forward. I jerked the throttles to idle and started the speed brakes out. Without stopping, I reached up, de-isolated, and threw the flap lever to the down position. I reached over and grabbed for the IFF selector switch and twisted it to EMER. I looked up at the airspeed indicator and gave another pull back on the throttles and speed brakes. 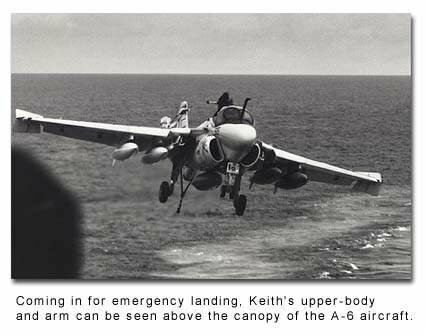 The airspeed was passing 200 knots. I looked over at my BN and I watched his body slam around in the wind blast. His eyes were being blasted open, his cheeks and lips were puffed out to an impossible size and the tendons in his neck looked like they were about to bust through his skin as he fought for his life. I checked my radio selector switch to radio 1. "Mayday, Mayday, this is 515. My BN has partially ejected. I need an emergency pull-forward!" The reply was an immediate, "Roger, switch button six." I switched freqs and said or maybe yelled), "Boss (Air Officer), this is 515. My BN has partially ejected. I need an emergency full-forward!" I slapped the gear handle down and turned all my dumps on (in an effort to get slower, max trap never crossed my mind). The Boss came back in his ever-calm voice and said, "Bring it on in." The plane was holding at around 160 knots and descending. My BN's legs were kicking, which gave me some comfort; he was not dead. But, watching his head and body jerked around in the wind blast, being literally beaten to death, made me ill. As I turned in astern the boat, I called the Boss and told him I was six miles behind the boat. I asked how the deck was coming. He asked if I was setting myself up for a straight-in. I told him "yes." He told me to continue. It was then I noticed that my BN had quit kicking. A chill shot through my body and I looked back at him. What I saw scared me even more. laying on his left shoulder. He was starting to turn gray. Maybe he had broken his neck and was dead. Bringing back a body that was a friend only minutes before was not a comfortable thought. I forced myself not to look at my bombardier after that. Coming in for landing I was driving it in at about 300 feet. I had been in a slight descent. I watched the ball move up to red and then move slowly up towards the center. My scan went immediately to the 1-wire. I had no intention of passing up any "perfectly good wires." I touched down short of the 1-wire and sucked the throttles to idle. The canopy shards directly in front of the BN's chest looked like a butcher's knife collection. I was very concerned that the deceleration of the trap was going to throw him into the jagged edge of the canopy. I cringed when I didn't immediately feel the tug of the wire. I pulled the stick into my lap, got the nose gear off the deck and then felt the hook catch a wire. As soon as I was free of my seat (I somehow remembered to safe it), I reached over and safed the BN's lower handle, undid his lower koch fittings and reached up to try to safe his upper handle. As I was crawling up, I saw that his upper handle was already safed. I started to release his upper koch fittings, but decided they were holding him in and I didn't want him to fall against the razor-sharp plexiglas on his side. I got back on my side of the cockpit, held his left arm and hand, and waited for the medical people to arrive. I realized he still was alive when he said, "Am I on the flight deck?" A wave of indescribable relief washed over me as I talked to him while the crash crew worked to truss him up and pull him out of the seat. Later, I found that the BN's parachute had deployed and wrapped itself around the tail section of the plane. Second, the timing release mechanism had fired and released the BN from the seat. The only things keeping him in the plane were the parachute risers holding him against the back of the seat. Although the tanker pattern can be pretty boring midway through the cycle, we were alert and maintaining a good lookout doctrine, because our airwing had a midair less than a week before, and we did not want to repeat. After my third fuel update call, we decided that the left outboard drop was going to require a little help in order to transfer. NATOPS recommends applying positive and negative G to force the valve open. As the pilot pulled the stick back I wondered how many times we would have to porpoise the nose of the plane before the valve opened. As he moved the stick forward, I felt the familiar sensation of negative "G", and then something strange happened: my head touched the canopy. For a brief moment I thought that I had failed to tighten my lap belts, but I knew that wasn't true. Before I could complete that thought, there was a loud bang, followed by wind, noise, disorientation and more wind, wind, wind. Confusion reigned in my mind as I was forced back against my seat, head against the headrest, arms out behind me, the wind roaring in my head, pounding against my body. "Did the canopy blow off? Did I eject? Did my windscreen implode?" All of these questions occurred to me amidst the pandemonium in my mind and over my body. I looked down and saw a sight that I will never forget: the top of the canopy, close enough to touch, and through the canopy I could see the top of my pilot's helmet. It took a few moments for this image to sink into my suddenly overloaded brain. 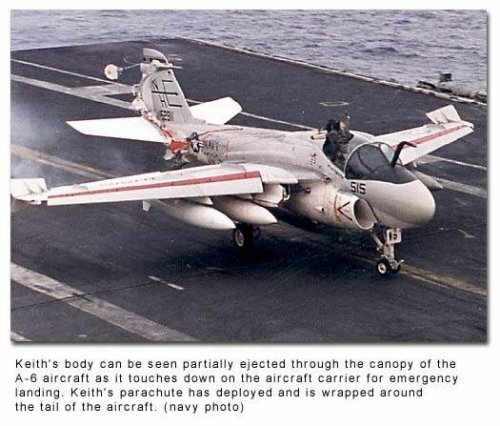 This was worse than I ever could have imagined - - I was sitting on top of a flying A-6! Pain, confusion, panic, fear and denial surged through my brain and body as a new development occurred to me: I couldn't breathe. My helmet and mask had ripped off my head, and without them, the full force of the wind was hitting me square in the face. It was like trying to drink through a fire hose. I couldn't seem to get a breath of air amidst the wind. My arms were dragging along behind me until I managed to pull both of them into my chest and hold them there. I tried to think for a second as I continued my attempts to breathe. For some reason, it never occurred to me that my pilot would be trying to land. I just never thought about it. I finally decided that the only thing that I could do was eject. I grabbed the lower handle with both hands and pulled-it wouldn't budge. With a little more panic induced strength I tried again, but to no avail. The handle was not going to move. I attempted to reach the upper handle, but the wind prevented me from getting a hand on it. As a matter of fact, all that I could do was hold my arms into my chest. If either of them slid out into the wind stream, they immediately flailed out behind me, and that was definitely not good. The wind had become physically and emotionally overwhelming. It pounded against my face and body like a huge wall of water that wouldn't stop. The roaring in my ears confused me, the pressure in my mouth prevented me from breathing, and the pounding on my eyes kept me from seeing. I was suffocating, and I couldn't seem to get a breath. I felt myself blacking out. My parachute became entangled in the horizontal stabilizer tight enough to act as a shoulder harness for the trap, but not tight, enough to bind the flight controls. 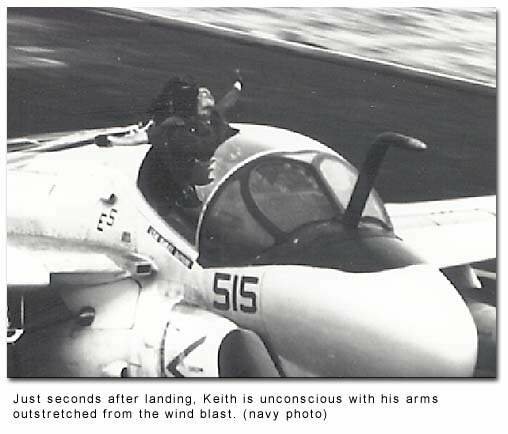 If this had not happened, I would have been thrown into the jagged plexiglas during the trap as my shoulder harness had been disconnected from the seat as the parachute deployed. Someone turned on the lights and I had a funny view of the front end of an A-6, with jagged plexiglas where my half of the canopy was supposed to be. Looking down from the top of the jet, I was surprised to find the plane stopped on the flight deck with about 100 people looking up at me. (I guess I was surprised, because I had expected to see the pearly gates.) My first thought was that we had never taken off, that something had happened before the catapult. Then, everything came flooding back into my brain, the wind, the noise and the confusion. As my pilot spoke to me and the medical people swarmed all over me, I realized that I had survived! Live Aviation | New to Airshows?